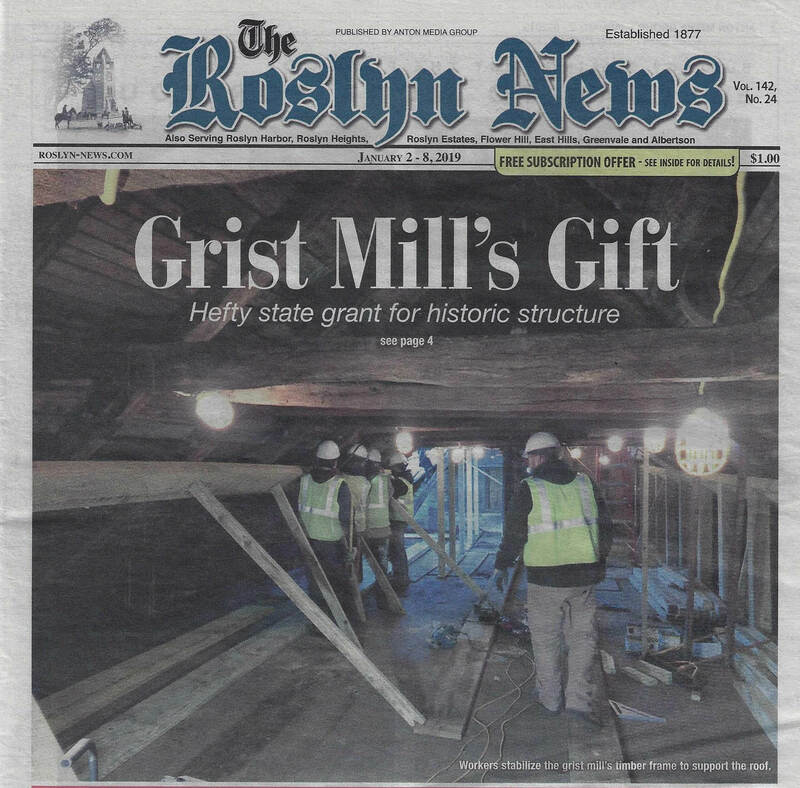 Below are the latest news articles on the Roslyn Landmark Society and the Roslyn Grist Mill Project. 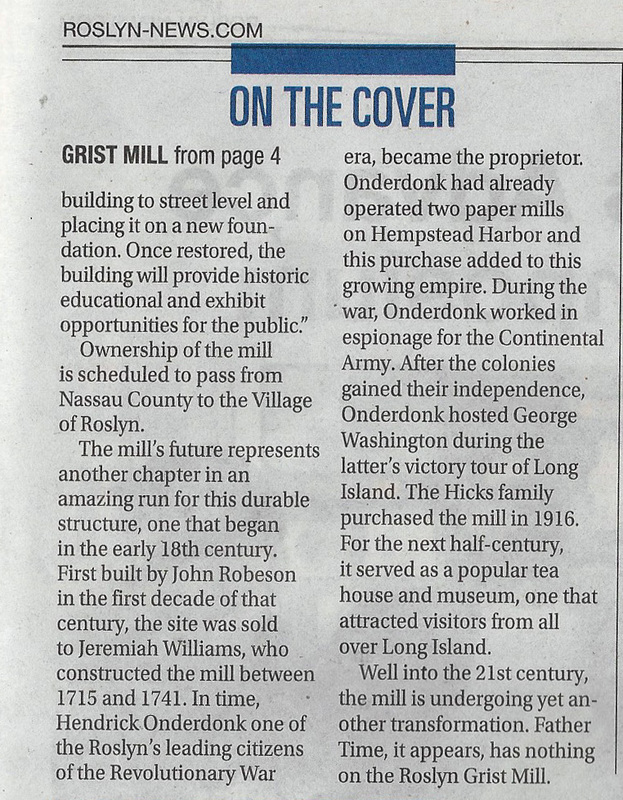 Join the Roslyn Landmark Society online for only $25 and receive a signed copy of Vanderbilt Cup Races or Long Island Motor Parkway. 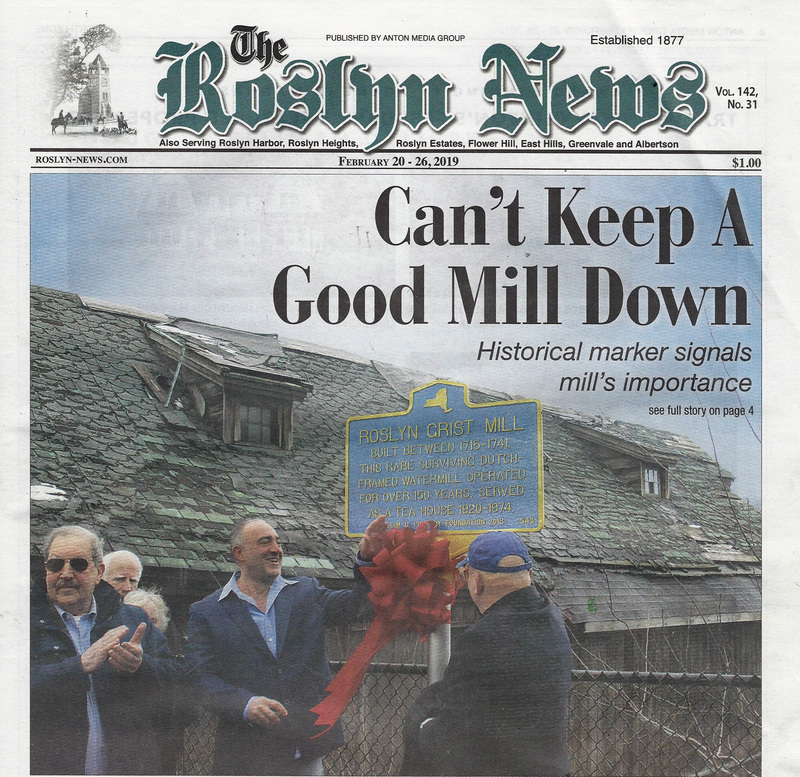 The celebration of the unveiling of the historic marker for the Roslyn Grist Mill was featured on Fox-5's a "New York Minute.". 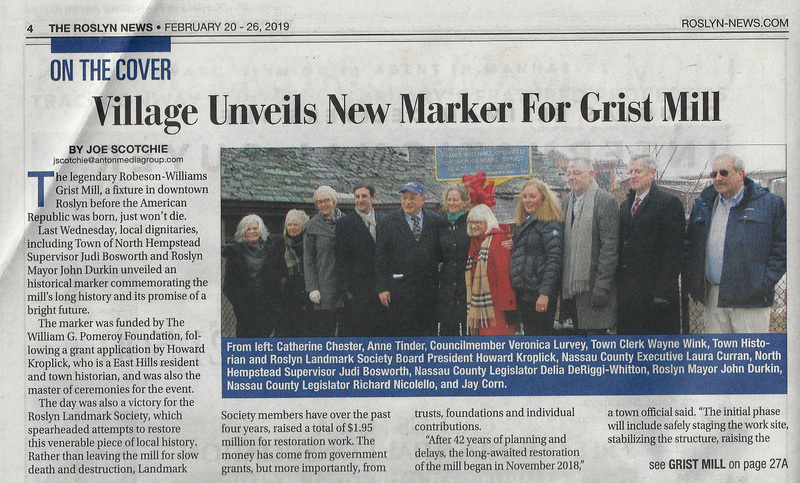 Photo courtesy of Russell Lippai, Town of North Hempstead photographer. 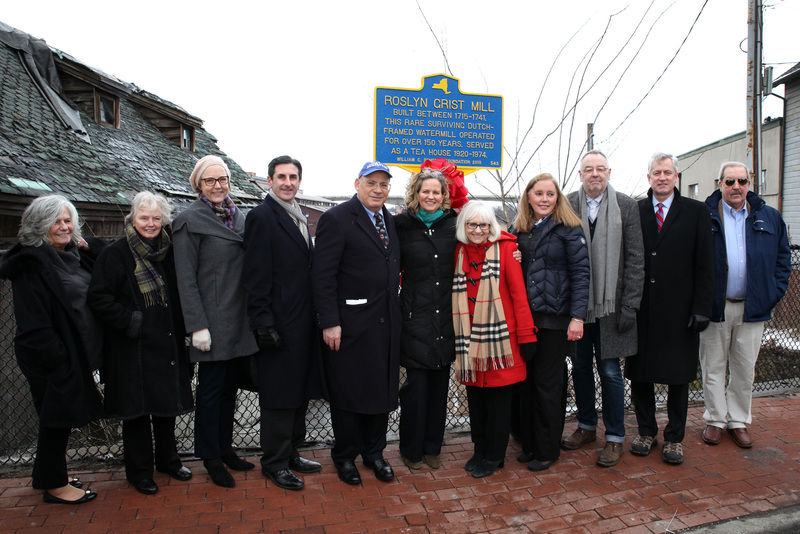 (Left to Right) Catherine Chester (Roslyn Landmark Society Trustee), Anne Tinder (Roslyn Landmark Society former Executive Director), Council Member Veronica Lurvey, Town Clerk Wayne Wink, Town Historian and Roslyn Landmark Society Board President Howard Kroplick, Nassau County Executive Laura Curran, North Hempstead Supervisor Judi Bosworth, Nassau County Legislator Delia DeRiggi-Whitton, Roslyn Mayor John Durkin, Nassau County Legislator Richard Nicolello, and Jay Corn (Roslyn Landmark Society Trustee). 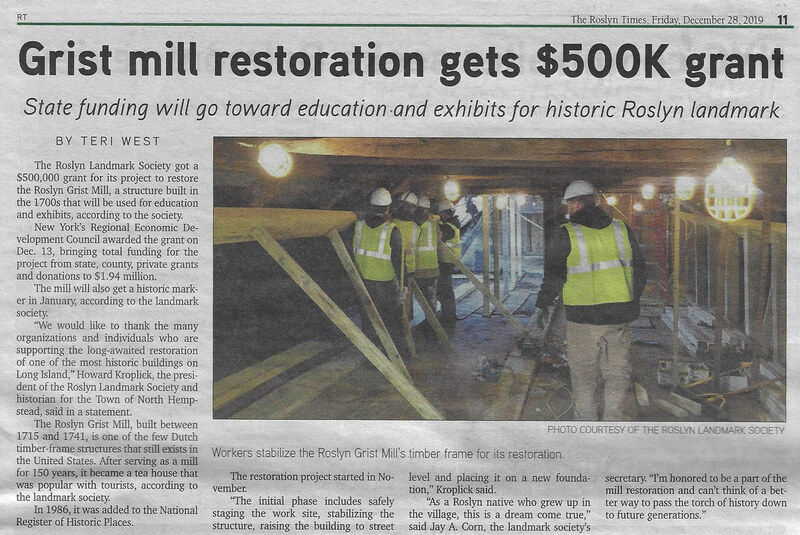 Newsday "Grist Mill restoration gets $500K grant"
Roslyn Times, "Grist mill restoration project gets $500K state grant"
Roslyn News, "Kroplick Elected Landmark Society President"
Howard, Is there’s membership card of the Roslyn Historical Society that I think I am as a member? (fork over $25 to John C. at the end of the Preservation meet), Also how about membership card of the Motor Parkway Preservation Society. Like to brag! Mark, no membership cards. But you can still brag!! 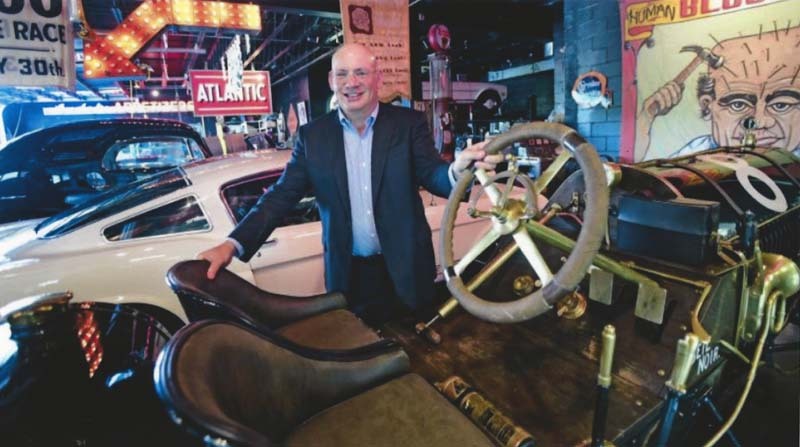 Absolutely wonderful to see all this restoration work evolve and become reality - it took many many decades to see the hopes and dreams that this would happen come about. Congratulations to all of those involved who made this dream come true, especially you Howard. 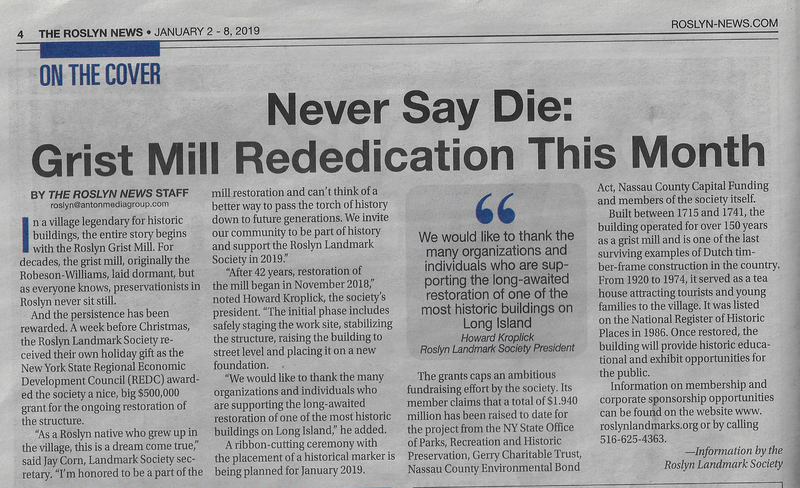 The restoration pays so much respect to the memory of all the people that worked there at the grist mill when it was new, this is a monumental achievement. Missed that. Glad Fox 5 TV broadcast this segment!